Tea, however British it may seem today, was in fact cultivated and commonly drank in China for centuries before being discovered by the Western World. Dutch traders were the first to import tea from China to Europe in the early seventeenth century, and it soon became popular in Holland. However, legend has it that it was the Duchess of Bedford, one of Queen Victoria's ladies-in-waiting, who invented "afternoon tea", to curb her hunger in the late afternoon. It was she who made this practice into a social event by inviting friends to join her for tea and small cakes at her residence. The British "afternoon tea" has become a very popular tradition, and is typically served in the late afternoon as a light meal between the main morning and evening meals. 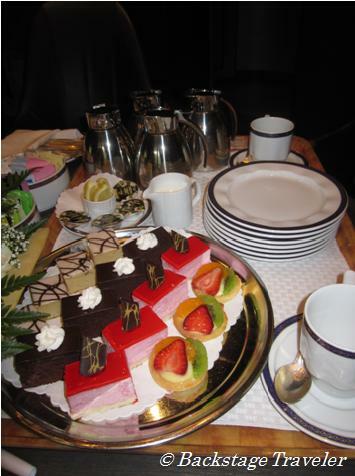 It usually consists of small sandwiches, scones or pastries served with tea. It is also referred to as "low tea" because it was usually served on low tables in a social, living room setting. The term "high tea" is sometimes used incorrectly to describe this tradition. 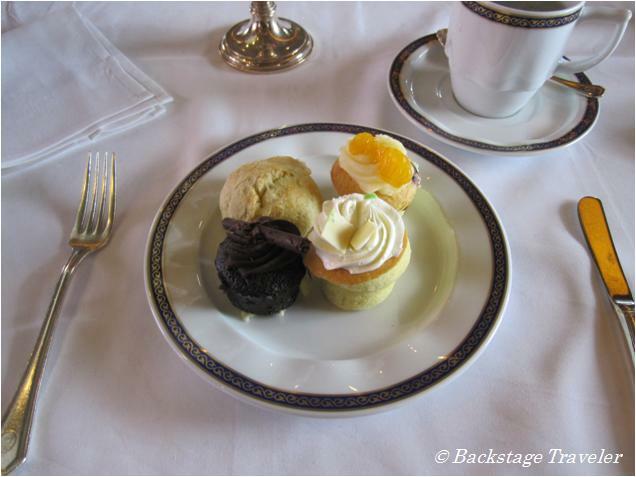 High tea actually refers to a more substantial meal, served from high tables (therefore "high" tea), and includes heavier, more filling dishes, such as those with meat. 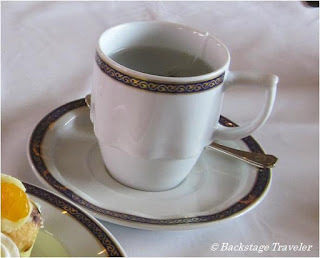 The formal afternoon tea tradition is alive and well on Holland America Line, and carries on the Dutch tradition of tea drinking, developed so long ago. 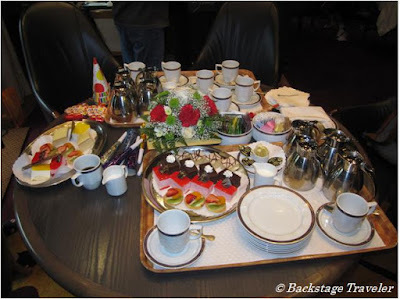 On our recent 7-day Alaskan Inside Passage cruise on the ms Zuiderdam, some form of afternoon tea was served in the main dining room between 3 and 4 pm every day. We were also able to have afternoon tea served in our stateroom, an added benefit for those sailing in a Deluxe or Penthouse suite. 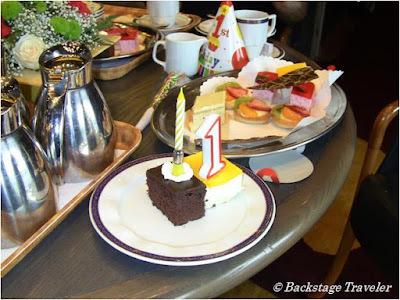 On the first day at sea, rather than attending the Royal Dutch Tea in the dining room, we asked our concierge at the Neptune Lounge, Charmaine, to arrange in-room delivery of tea and goodies to celebrate a birthday. At 3:30pm, as requested, two large trays laden with teapots and assorted tea bags, cups and saucers, milk, honey, lemon and sugar, and a plate full of goodies were brought to our cabin. The tea selection included the ubiquitous Earl Gray, as well as several herbal tea choices, all of the Bigelow brand. At the Neptune Lounge, tea lovers can also choose from several flavors of Harney & Sons premium loose-leaf tea in silk sachets (a larger, fancier tea bag that allows loose-leaf tea to expand). The small cakes and pastries served with our tea were plentiful and delicious, and served well as a first birthday cake! 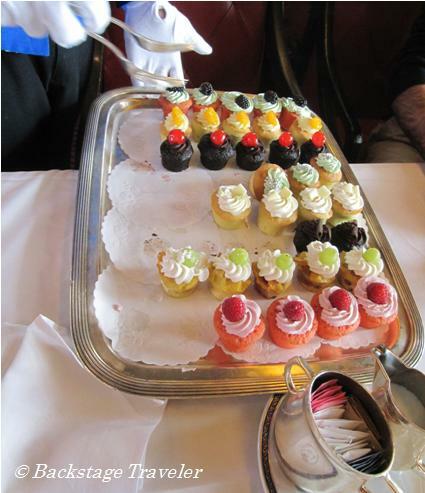 We ventured to the dining room on Wednesday afternoon for the special "Cupcake Tea". Our group was seated quickly at a table by the window, and almost immediately surrounded by white-gloved waiters; one with a box holding a selection of Bigelow tea bags, another serving hot water to brew each person's tea of choice, and a third proffering a tray full of delicious-looking mini-cupcakes. There were eight different flavors of cupcake from which to choose. Some were very similar, such as the two chocolate cupcakes, which differed only in the decoration on top (one had a cherry and the other a piece of dark chocolate). The raspberry cupcake was truly different, however, having a moist, raspberry-flavored cake covered with a sweet pink frosting and a fresh raspberry on top. It was also our group's overwhelmingly favorite cupcake. The cakes were surprisingly solid, and not overly sweet. Each one could be finished in two or three bites, so one could easily try a few different flavors without feeling overly greedy! 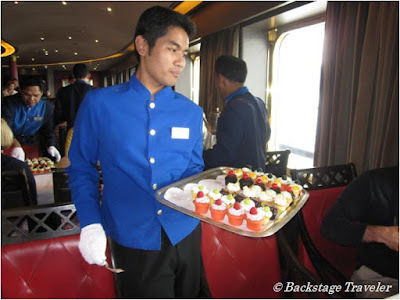 Cruisers on Holland America Line have many opportunities to enjoy the indulgent afternoon tea tradition, which is a delicious way to cure any late afternoon hunger pangs, and should not be missed!